I’ve known Asma for many years, since I attended several of the supper-clubs she ran in her home. After those, a residency at the Sun and 13 Cantons pub in Soho. And finally, her wonderful Darjeeling Express restaurant. That’s not the end of it though, as she also launched Calcutta Canteen in Market Halls, Fulham Broadway this year and I’m confident there are more new projects to come soon. She has finally responded to the increasing clamour for her recipes by working with Pavilion Books on her first cookery book, Asma’s Indian Kitchen. Like Asma, the book is down to earth but with a touch of bling, is packed with delicious recipes and of course, lots and lots of stories. One of the things I love about visiting Asma is her love of telling stories, in fact, she’s a real talker and sometimes I wonder how she has time to also supervise the cooking! (I joke, of course, because one of her many great achievements is the impressive training of her all-women kitchen team, a personal endeavour to support and lift up “second daughters”, traditionally undervalued in Indian culture – the team are perfectly capable of faithfully cooking Asma’s recipes and running the kitchen in Asma’s absence). The mix of recipes in the book echoes Asma’s personal story. Her culinary heritage was a rich one, born to paternal and maternal royal ancestry – each with their own cuisines. She grew up in Calcutta and moved to Cambridge, England in 1991. At that time, she couldn’t cook at all, and turned to discounted Indian cookbooks in her desperation for a taste of home. Teaching herself to cook helped with the homesickness, and then, during several trips back home, she gradually learned the recipes that had been in her family for generations, not only from her mother but from her grandmother, aunts, cousins, family friends and the cook that worked for her parents for many decades. As such, her cooking covers a swathe of regional India, and looks to both royal feasts and simple street food. The book begins with Asma’s introduction to this personal history, before discussing a number of techniques essential to elevate your Indian cooking, from the proper browning of onions to the use of chillis and spices. Recipes are divided into four Chapters – Feasts for Two, Family Feasts, Feasting with Friends and Celebratory Feasts. These are followed with a series of menu suggestions to help you pull the various recipes together into coherent meals. Not all the recipes have photographs, but many do, simply styled to place the focus on the food. Interspersed throughout the book are more of Asma’s personal stories and recollections, plus wonderful photographs taken by Ming Tang-Evans who accompanied Asma during one of her visits to Calcutta. These bring to life Asma’s tales of her family, her memories and the food! Regulars of her restaurant will be pleased to spot some of their favourite recipes from the menu – such as her delightful beetroot raita and a personal favourite of mine, her tomato chutney. The recipes are designed for the home cook, so everything should be absolutely achievable in a regular domestic kitchen. 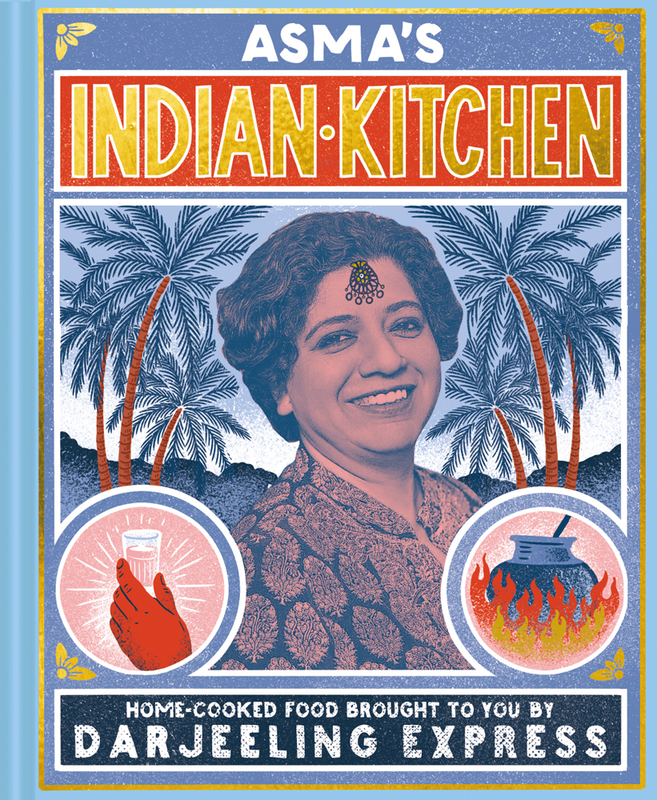 We have three copies of Asma’s Indian Kitchen by Asma Khan. to giveaway to readers of Kavey Eats. The prizes include delivery to a UK address. Please click here to enter and for terms and conditions. I’ll be sharing extracted recipes with you soon for Hyderabadi Tamatar Ka Cutt (Eggs in Tomato Gravy), and Tamatar Ki Chutney (Tomato Chutney with Prunes and Apricots). Kavey Eats received a review copy of Asma’s Indian Kitchen. Published by Pavilion, RRP £20, this title is currently available on Amazon UK for £13.20 (at time of review). 10 Comments to "Asma’s Indian Kitchen | A Cookery Book from the Creator of Darjeeling Express"
What a lovely inspirational woman! This looks like a great recipe book – I will definitely need to check it out! Thanks so much for the intro and review of Asma’s cookbook – sounds like a wonderful addition to my collection as well. Sounds like a great cookbook. That tomato chutney sounds delicious, I am excited to see the recipe! Sounds like such a great recipe book! I’ll definitely be checking into getting one for myself! Thanks for sharing this cook book review. I always enjoy reading new cookbooks especially ones with personal stories that go along with the recipes. Since I read cookbooks like novels and Asma loves to tell stories, I think I need to pick up this book. It looks like a great weekend read (and eat). I love recommended cook books and I will adding this to my wishlist. Cookbooks that have an interesting personal history really make them come alive. I love a good story teller. I had been swearing I wasn’t going to buy any more cookbooks but admit this one is seriously tempting… I really enjoyed the food I ate in Bengal earlier this year.